Good afternoon, my fellow beer appreciators! Did you nap well? Do you remember what happened this morning? Ah, let’s not speak of it. Let’s instead hark back to the brighter times of 2013, when it looked for a brief period like American amber ale was about to have an extended Moment. If I remember correctly—and there is absolutely no reason to believe I do—sometime around the middle of that fall, a lot of our better brewpubs and small breweries were experimenting with the often overlooked red ale. But whereas red lovers were hoping for a true revival, it seems in retrospect to have simply been that particular style’s turn to be put through the imperializing, aging, and Indiafication processes that white ales, black lagers, purple horseshoes, and every other magically delicious breed of beer must eventually endure. It’s fun and foolish to mock the ever-expanding catalog of beer styles, because all of the hypotheticals eventually come to pass. We will have a double dry-hopped white porter soon enough, and we may even like it. So we had a lot of red IPAs for a while, and some of them were pretty damn good, and now many of them have disappeared. There are still hoppy red ales out there, but you need to know where to look, because they’re rarely flying their fleet’s flag, and they employ several different naming conventions. Sierra Nevada Flipside Red IPA is a nice early-autumn microseasonal; Tröegs Nugget Nectar is an annual spring miracle that identifies as an imperial amber (but you and I know better), and their HopBack Amber is a less exceptional but more accessible year-round version. There are options for the red heads, but there’s still room for many more. Lonerider Brewing of Raleigh, N.C., is now in their seventh year, which is pretty impressive staying power for an outfit that chose to build around its hefeweizen. Shotgun Betty is, I admit, a pretty good beer, but sheesh. Then again, I suppose that’s the sort of, uh, bold thinking that led them to devote the necessary resources into putting together Red Spur, which is the best new-to-me amber ale I’ve come across in at least six months of dedicated searching. The American-style red/amber ale category is a bit of a catchall, partly because most beer styles are, and even more so because the drinking public doesn’t pay enough attention to reds. Amber ales have traditionally been more malt-forward than the most popular modern craft-beer styles, though the better ones are starting to get hoppier, including Red Spur, which Lonerider classifies as a red IPA. Their color can be pretty much anywhere between a pale ale’s and a porter’s; Red Spur is a nice, deep cordovan. 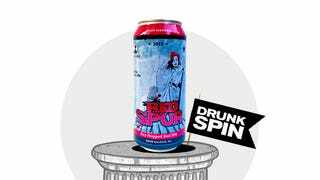 The style’s alcohol content also varies widely, with Red Spur sitting on the high end at 7.3 percent by volume. Red Spur opens with a sweet blast of caramel, followed by an unexpected note of black pepper before the earthy, resinous, slightly orange-tinted citrus hops show up. The flavor is more astringent than expected—in a good way—with the lightly roasted, toffee-covered pinecone character augmented by a hint of peppermint. The taste turns vaguely tropical with time, along with a faint suggestion of melon, before the pine returns to dominance on the long, dry finish. Lonerider Red Spur is a standout beer in an overlooked category; track some down this summer if you need a little something to keep you going until the more widely distributed seasonal reds start coming back around after Labor Day.